Ariana Grande is happy, and it’s important to her that people know that. Still, it would be hard to miss her happiness on this sunny spring day at a ramshackle house in Beverly Hills. It beams out of her as she sprawls on the lawn, murmuring in baby talk to Toulouse, her rescue beagle-chihuahua, and it suffuses the way she vogues out of the house into the yard, spinning and twirling in a frilly gray tulle dress. She has a lot of reasons to be happy. 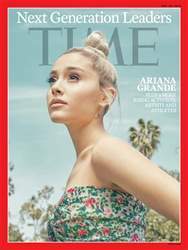 At twenty four, Grande is one of the biggest pop stars in the world. This week, we look at Ariana alongside nine other young stars who are reshaping music, sports, fashion, politics and more.